The Comedy of Errors stage at Rockwood Park. Photo by Alessandra Nicole. Before the Stooges and the Marx Brothers, there was The Comedy of Errors. The play, one of William Shakespeare’s earlier works, is a madcap, slapstick, double mistaken-identity romp. True confession: While driving to the opening night performance at the beautiful Rockwood Mansion, this reviewer asked his Lovely Bride to pull up the play synopsis on her smartphone and read it to him. Arguably, to offer a written synopsis of the play will lead to frustration and confusion for both writer and reader – The Comedy of Errors simply must be experienced. And the experience with this cast and musicians under the direction of David Stradley is delightful, fun and surprising. Luke Brahdt and Brendan Moser play the identical twins – both named Antipholus – separated at birth by shipwreck.Chase Byrd and Sean Close play the identical twins – both named Dromio – separated at birth by shipwreck. of Ephesus), Abdul Sesay (Officer). Photo by Alessandra Nicole. Go back and re-read those last two sentences, and you’ll see why a written synopsis can be confusing and frustrating. The performances by this cast are wonderfully over-the-top, the dialog is downright musical, and the choreography has all of the fun of slapstick with none of the pain. Everything about this comedy supports the creativity and innovation that is associated with the Delaware Shakespeare Festival: a long runway for a stage with doors on wheels; colorful lighting, costuming that is at once colorful and useful (remember, two sets of twins – the costumes really help in keeping the whole thing straight); and a jazz trio – saxophone, bass, percussion – that perfectly sets and elevates the tone throughout the performance. If you're ready for a lighthearted, fun, engaging evening, you'll want to get these tickets, pack your lawn chairs or picnic blankets and come out to Rockwood Mansion. Oh, and read the signs on the sidewalk on the way up; there’s some great information there that will make the show that much more enjoyable. 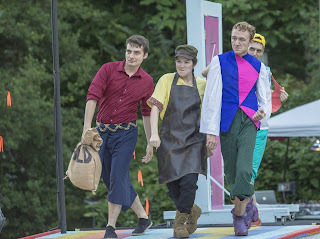 The Comedy of Errors runs for 13 performance this month, Wednesday to Saturday at 7:30pm with gates opening at 6:15pm for preshow entertainment and picnics. Sunday performances begin at 6:00pm (gates open at 4:45pm). No shows are scheduled for Monday or Tuesday nights, although Tuesday, July 26 is a rain date, if needed. The fourth annual Janssen’s Market Picnic Contest – in which patrons bring their best spreads to compete for the coveted Picnic Contest trophy and bragging rights – will take place on Saturday, July 23. 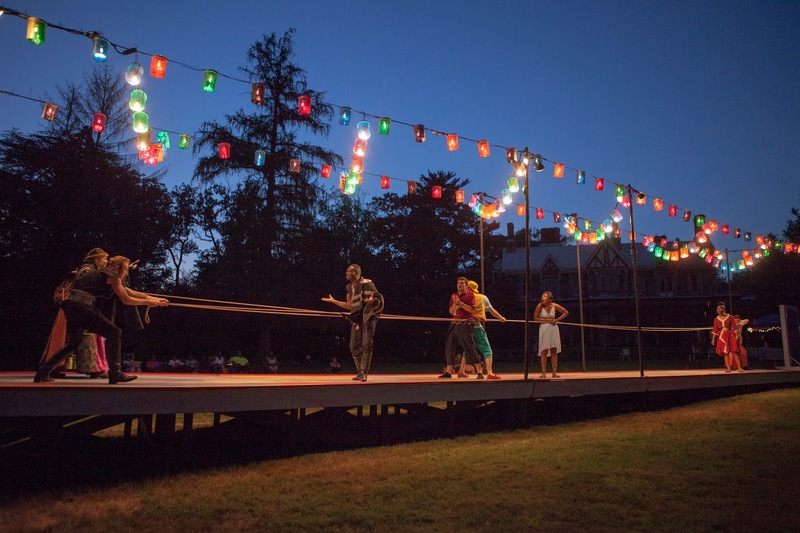 General admission to the festival is $18 (some of the most affordable live theater tickets around). Tickets are $16 for seniors (65+), and active military (and their families), with identification. Student tickets are $14. Children 5 and under are free at every performance. Every Sunday is Family Night, with special activities for children 12 and under admitted free with a paid adult admission.